Never do this: smartphones can be deadly to magnetically stored data in some circumstances. In my dealings with preserving older, born-digital documents and data, I’ve run into this situation quite often: Someone comes into the DCRC with a 3.5″ floppy disk or other magnetic media and asks if we can help them migrate the data to more modern storage, such as a USB flash drive. We do maintain a couple of floppy drives for this purpose, so normally we can help. However, we sometimes cringe and express a bit of concern at how they’re holding the floppy disk(s) being brought in, or rather, what people commonly hold those old disks against. What’s the problem? Smartphones, and sometimes tablets or even modern laptops. With mobile devices being nearly ubiquitous in the US and particularly among college students and faculty, it’s a normal occurrence to see them being carried around in one’s hand. 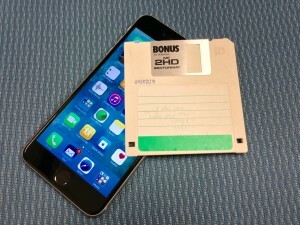 It’s also not uncommon to stack a smartphone against some other object a person might be carrying… like a book, or a laptop, or, unfortunately, that floppy disk you might want to recover data from.